Farmers and butchers gathered at the Thainstone Centre, near Inverurie, for the Aberdeen Christmas Classic earlier this week. The event, as shown in these behind-the-scenes pictures, was organised by Aberdeen & Northern Marts (ANM) in conjunction with the Aberdeen Fatstock Association. It featured shows and sales of prime cattle and sheep, pedigree beef bulls, pedigree female sheep, and a show of exhibition calves. The prime cattle champion was a home-bred Limousin cross heifer, Cheeky Kiss, from Wilson Peters, Monzie, Crieff. 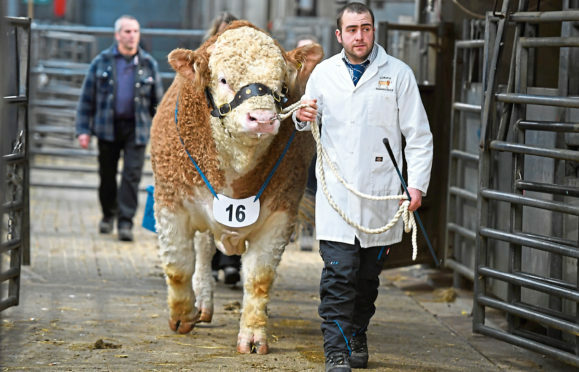 By Anside Hawkeye, and weighing 610kg, she sold for £4,600 (754p/kg) to the judges – Hugh Black, Lanark, and Murray Lauchlan, Comrie. The prime lamb championship went to two home-bred Suffolk cross lambs from father-and-son duo Willie and John Brown, Hilton of Culsh, Turriff. They sold for £200 each to the judge Louise Forsyth for WTS Forsyth Butchers, Peebles.